Muntjac, a.k.a. the barking deer, is the native of India and China. However, hunting opportunities for this small and ancient species in their original range exist today only in Nepal. Muntjac was introduced to Great Britain, where they form a large and stable feral population, and are becoming an increasingly popular hunting quarry. Muntjac hunting in Great Britain is quite affordable for the country. Cull hunt offers may start as low as $150 a hunter a day, before trophy fees. The trophy fees are in $50 range a head for a female, and up to $700 or so for a record trophy buck. Allow Muntjac hunting in Nepal is usually offered in combination with blue sheep hunts, and is priced accordingly. When to hunt Muntjac Deer? In Great Britain there’s no closed season for muntjac hunting, however, most outfitters time these hunts to the cull/hind season for other kinds of deer, deer, that runs from November 1 to March 31. Muntjac deer does go into heat at any random time, and bucks don’t shed their antlers, so any time within this period is as good as another. Small and secretive, the muntjac deer is not so easy to harvest. The peculiar bark of the muntjac deer is a sign of alarm, and can’t be used for calling; they seldom come into the fields to feed, so hunting from blinds or high seats Euro style is not especially promising. Spot-and-stalk is the most popular option. 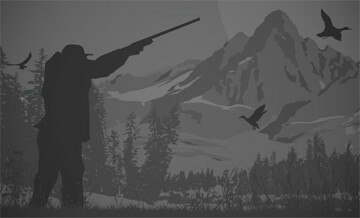 Prepare to rise early, as the best time for hunting is at dawn, and you want to be on the hunting grounds at least an hour before sunrise. Be prepared that the guide will insist to carry your rifle and hand it to you just before the shot – in a country as densely populated as England and Wales, it’s an important safety concern. The muntjac is believed to be one of the oldest existing species of deer-like creatures. The males carry both short and usually unforking antlers and large canine teeth, giving them a ‘vampire deer’ look. It was introduced to Britain well over a hundred years ago, but for some reason didn’t attract much attention of hunters until recently. One of the most important reasons for hunting muntjac deer is population control. Even though they don’t do as much damage to crops as other kinds of deer, overpopulation may have serious consequences for the forestry, and vehicle collision is also an issue. What could be more important for hunters, however, is that these creatures provide an affordable and challenging big-game hunting opportunity within a short drive from Britain’s biggest cities. All our deer stalking is carried out on foot and the use of highseats if required. A typical day stalking is out at dawn, stalking for 3 hours, breakfast. We recommence stalking roughly three hours before dusk. All our stalking is on free/wild deer. We cater for novice stalkers all the way through to experienced stalkers. Trophy Muntjac deer price is indicated per cm on the longest antler. All our deer stalking is carried out on foot and the use of highseats if required. A typical day stalking is out at dawn, stalking for 3 hours, breakfast. We recommence stalking roughly three hours before dusk. All our stalking is on free/wild deer. We cater for novice stalkers all the way through to experienced stalkers.